Or maybe he's just fixing that side. You know how people submitted a ton of chessboards-on-a-roller-coaster pictures to Randall in response to http://xkcd.com/249/? I feel this summer we should have something where people design this exact castle on beaches and send in photos. I have a vague feeling he's just going to walk away now. No. Bad. Get back to where you belong. I specifically signed up just because of this one, and also to be a part of the "challenge accepted," to make this the number 1 talked about topic. Secondly, I like that a lot of us have turned more to the idea that it's a good joke/test of faith in Randall, and/or "a watched pot never boils," homage. Sadly, I'm more wrapped up in the baby/cancer theories... which are two terrible words to put next to each other. Regardless of what this is about, I wanted to recognize that Randall has a dedicated fanbase that actually cares about what's going on, enough to follow that cancer is a big issue in his life, he has his wife as a partner in crime, and that we're all (deep down,) hoping this ends on a good, symbolic note. Count me as another time-traveler. Apparently from 6 years in the past. What'd I miss? Maybe he could replace the "Store" link with the forum. After all, there's also a bigger link to it right on the side. Djehutynakht wrote: I feel this summer we should have something where people design this exact castle on beaches and send in photos. This is like the performance art version of a comic. Neat! I'm going to do something with this tomorrow. But for now, I should probably get some sleep. Last edited by Uninfinity on Wed Mar 27, 2013 5:40 am UTC, edited 2 times in total. If part of the castle collapses as he is apparently climbing out of it, it would be too amusing for words. By the way she vanishes, I get the impression she's still there, either inside or behind the largest castle. Perhaps she'll jump out and yell "surprise" like it's a birthday cake. Or maybe he's been watching Kubrick, and noticed how occasionally there are different numbers of people present in a scene between camera shots. I decided to tackle the pregnancy theory, because most of the other theories are too goddamn depressing. EDIT: These aren't thought bubbles, but I can't be bothered to go back and make them thought bubbles. Last edited by Goggalor on Wed Mar 27, 2013 5:46 am UTC, edited 1 time in total. I really want this to end up looping, which wouldn't be too hard to do - just have a wave destroy the sandcastle. Atmosck wrote: I really want this to end up looping, which wouldn't be too hard to do - just have a wave destroy the sandcastle. But if it looped, this thread would stop being so interesting and we all would have to go back to our lives. And we don't want that, do we? Ah, but we can't ever escape, because we know if it started looping that at some later point he'd break the loop and start progressing again. We are all trapped watching it forever. Zane0909 wrote: baby/cancer theories... which are two terrible words to put next to each other. I personally think that this MMONS is going to go on for years. I saw the java back early the first morning firstly when I was wondering what 'wait for it' meant. But by the time I read the comments, someone else eventually mentioned it near the end of them. You know something about Time? It's linear and does not loop. Crissa wrote: You know something about Time? Have you ever been outside of it? Last edited by AluisioASG on Wed Mar 27, 2013 6:01 am UTC, edited 1 time in total. Looks like he's behind it now. If that was the first pic I'd seen, I would assume it was the sun setting behind the castle, not his head. 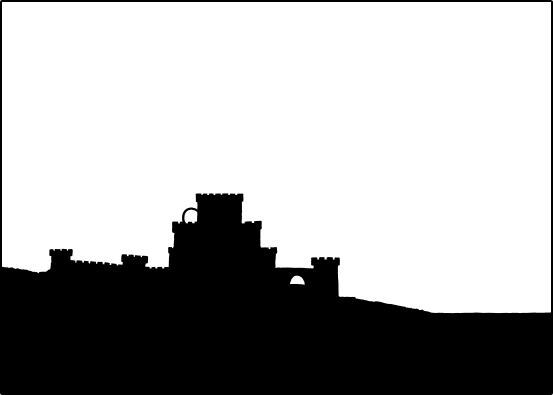 TheMulattoMaker wrote: If that was the first pic I'd seen, I would assume it was the sun setting behind the castle, not his head. It's not circular enough to be the a sun. Yet another lurker registers just to comment on this comic. I've seen massively long threads here for other xkcd comics, ("click-and-drag" comes to mind) but wow. 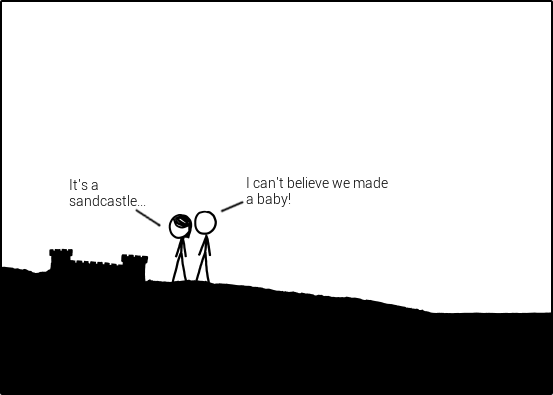 Someone posted earlier about xkcd . aubronwood . com. Whoever runs that is a genius. I'm watching it for further progress of this animation. joshumax wrote: I have exactly 0 time to read the above posts so I'm sorry if I'm repeating any..
Also I think the sand castle will be destroyed after the tide rises. Hey there! While we're waiting for the next frame, thought I'd pop in and re-post some explanation for the newcomers wondering about how this thing actually works that haven't read through the whole thread. And yes, it's mostly because I like think my analasyis is pretty cool. Whatevs. I posted a detailed breakdown earlier, but briefly, here's my annotated, de-obfuscated code. Basically, it listens for instructions from xkcd's server and follows them. Those instructions at this point are either "load a new image" or "reload the page". So, you don't have to mash F5, it will automatically update the image when they're available. We have no way to control how fast the images come or when they do, and it's quite possible for them to update forever. Thought I'd registered long ago, but ... computers. I love it when he messes with my mind like this. Many thanks to those who collected the images I didn't see in real time. Time, wait for it. Ummm no, don't. It's already gone. perhaps we, in our reactions, are the true show- and all randal has to do to start the loop is to post an interesting/thought provoking comic? EXACTLY! Thats time for you! I'm expecting a kind of Spanish Inquisition. Wait, no, that can't be right. Nobody . . . .
. . . and then there were none.